“It’s a sin, wickedly rich and fattening, but every spoonful is glory and that’s what chocolate mousse is supposed to be”. Julia child. These challenges just don’t seem to stop! It’s Dom’s turn again with his Random Recipe challenge from the wonderful Belleau Kitchen – if you haven’t yet discovered this blog, I’d suggest you take a look. My New Cook Book chosen by Lou of Please Do Not Feed The Animals immediately appealed to me. To my delight, the challenge was to pick a recipe at random from the most recent cook book given to you. As usual with this challenge, I only select from my chocolate cook books, which rather limits my choice as I only have eight of them – well actually rather more than eight. This was a perfect opportunity to use a little gem I had been sent in the post a few months ago by a lovely friend along with a beautiful and subsequently much worn necklace she had made for me. Melted 6oz 70% dark chocolate with 6oz unsalted butter over a pan of hot water. Mixed until smooth, then removed from heat. Stirred in 3 tbsp rum. Blitzed 3oz walnuts in a coffee grinder. Separated 4 duck eggs (large hens eggs will do) into two bowls. Whisked egg whites with 1/4 tsp cream of tartar until soft peak stage. Gradually added 2oz caster sugar and continued to whisk until stiff. Added 4oz caster sugar to the egg yolks in the other bowl and beat until mixture was pale and had doubled in volume. Folded in chocolate mixture followed by the walnuts and 1oz sifted flour. Lastly folded in the egg whites 1/3 at a time. Poured into a 9″ silicone mould (recipe stated 8″, but I don’t have one of those) and baked at 180C for 20 mins. The torte rose beautifully, but like a soufflé promptly sank soon after leaving the oven. It smelt wonderful and as an added bonus the scent of chocolate and rum seemed to find its way into every crevice in the house as well as wafting into the garden. These were just right for a hot summer’s day (which it was), not dense like a brownie but light and mousse like. They were cool in the mouth but also melted on the tongue. The chocolate was rich and strong; the rum was subtle yet lingered pleasantly on the tastebuds for a while after the torte had disappeared. They went extremely well with a good sized dollop of strawberry cream – a recipe that will be appearing here at some future date. Faffier to make than your average brownie, these are well worth the effort for a special occasion, or in our case, a not so special occasion. Aha! These sound like dessert brownies to me – best served warm and with a dollop of cream, as you say, or even ice cream. Or, perhaps, both 😉 Yum. They sound really wonderful – lucky ramdom choice there! Yum! Its breakfast time. Your lastest creations sound like the perfect breakfast dish! They look delicious, and I’m very impressed that you’ve already managed to do the RR challenge! I love the texture of this sort of fallen souffle brownie. So rich and decadent! Always a good thing when the smells of chocolate and rum waft through the garden. This looks sinfully delicious. I love the idea of using walnuts in place of the usual almonds that most recipes use. I really don’t use walnuts enough. I have to make these. The idea of light and mousse like is more than I can handle. Please link this to Bake With Bizzy. It will inspire me to get baking. Anything with chocolate sounds super YUM and delicious to me..and these looks so perfect! love the recipe..thanks for sharing! I love walnuts in brownies. Delicious! Those squares of chocolate look divine! ooh I love walnuts. This sounds lush. Anon – hope you enjoyed breakfast! Baking Addict – it’s a very cute book. Dom – it looks classier than my average book and I’m very glad you gave the opportunity to use it. Of course it’s always a chocolate weekend here. At some point I’ll probably have had enough of chocolate and that will be the end of this blog. Gloria – it’s a lovely little book and I’m hanging on to it. Foodycat – I’m always up for rich and decedent. I just can’t believe how light they are. Katie – you’re right and they work really well too. Bizzy – let me know if you ever do make them. Johanna – agree with you of course, think I could eat these pretty much any time too. MCB – it’s fun to try the walnuts in a different form for a change. Janice – I’ll go with lush. Looks very moreish, Choc! And I love the delicate tinge to the cream, just beautiful! Sounds and looks delicious. I also love your little aside (large hens eggs will do) I hope you are saying it in your snootiest voice to give it the full effect 😉 I love that rose plate too, what pattern is it? CC – I tend to use walnuts as crunchy pieces of nut, but haven’t used them much ground up and they work surprisingly well. Celia – Glad you noticed the colour, it didn’t show up well in the photo, but it was a lovely pale pink. I think you’d like these Celia. Kath – Oh sorry, didn’t I sound snooty enough, will have to try harder next time – he he. I have a collection of odd saucers I’ve picked up in jumble sales over the years – that one is Dorchester – no cup to go with it though. These are beautiful. Having just tried making brownies for the first time (only semi-successfully) I am now determined to get better at these types of treats. The crusty top on yours looks sublime (more sublime than I’ve made it sound!). Perfect with a scoop of homemade vanilla ice cream, and maybe some fresh strawberries (I love berries and chocolate together). Interesting that you separate the whites and yolks – what does this achieve? Are they less dense than brownies? 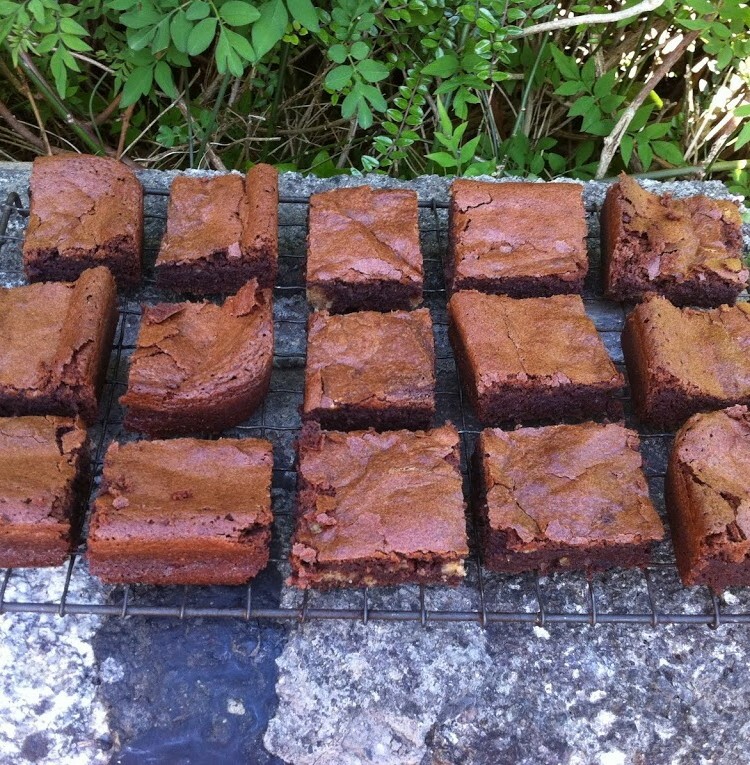 Monica – I like a good dense fudgy brownie but these are something quite different. They are really light and almost melt on the tongue. Posh brownies for a dinner party rather than say for a bbq or picnic. But like a good brownie, they seem to be keeping well. Just had one now. Interestingly the rum has developed and is now more noticeable than it was initially.